The Arlandrian: At What Cost? 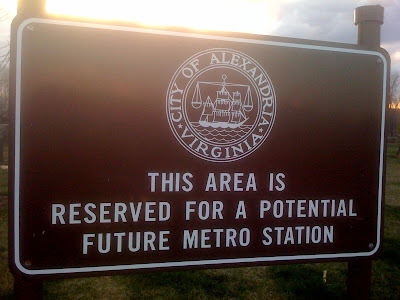 Sign for the Potomac Yard Metro Station on the east side of the tracks. Yesterday's post on the Arlandrian raised an interesting issue prompted by discussion of the Potomac Yard Planning Advisory Group. This group, charged with giving input into some basic issues confronting the proposed redevelopment of the Potomac Yard Retail Center, discussed possible options for the placement of a new, in-fill Metro station. There's a lot of history behind previous land-use decisions that have gotten us to this point -- too much to review here (once up a time there was talk of TWO stations with another at South Glebe Road) -- but instructive nonetheless regarding whether the current vision will ever see fruition. The bottom line is that it's a matter of cost. The estimate for an in-fill station at the current location reserved for Metro is approximately $120 million. This is what it would take to put a station at the end of East Glebe Road behind the future town center (recently approved) that is slated to come just south of the current Target store. What complicates the new construction is that the Metro rail line runs to the east of freight rail lines. That is, the new Metro station would have to be built on the wrong side of the tracks from where any new development would occur in Potomac Yard. The advisory group's idea would instead underground the station and tracks and place a station closer to Route 1. This would put the station nearer existing populations and in the middle of any new development that comes out of the current studies. The back of the envelope cost estimate puts this at 3-4 times the cost of the in-fill station. A lot of money. The current strategy is the find a level of development amenable to the public that also provides a developer enough revenue to pay for the station. The $100 million would be a big hit to any developer's plan...$300-$400 million even more so. But is it unprecedented? BeyondDC had this story yesterday that gives a little perspective. It talks about the complaints about new VRE service that is costing the Commonwealth almost $20 million, but "less than the $20 million it costs to design and build a one-mile stretch of new road." It goes on to talk about the relative costs of other projects, such as the $127 million-per-mile that the Inter-County Connector will cost in Maryland and the $27 million-per-mile that the Columbia Pike Street Car project will cost in Arlington. So what's is really worth to get Metro in Potomac Yard? Is it worth a mile of new highway? Metro Station marker with view of new Potomac Yard Fire Station construction on East Glebe in background. How is this that much of a problem? Just build a bridge over the VRE tracks. Or a tunnel under them. Not a huge issue. I guess I think of it like this: how hard is it to get to the average Metro platform from the station's entrance (or from the popular destination around the station)? For that matter, how hard would it be to get to an underground Potomac Yard station from the development itself? Now, compare that to how hard it would be to walk over a bridge (or through a tunnel) to get to a station. Not that hard. Plus, I'm sure that however expensive the bridge/tunnel would be, it wouldn't be near the cost of building a whole underground station. From a cost perspective, the underground station does seem a bit ridiculous. However, when you consider that the owner of the current Potomac Yards shopping center might foot a large portion of the bill if they could get the property in the center of their location, the cost could be less of a factor (they are planning to completely redevelop that center, as well). It would make their property that much more valuable. The cheaper alternative only provides a station a few blocks away from even the edge of their development and a half mile from the other end. If the city was expecting to foot the bill, this wouldn't even be a conversation. The problem? The problem is people don't walk a very long distance from the metrorail station. To get people to use it with regularity, the development should be within 1/4 to 1/2 mile from the station. Have a look at the satellite map of the area (there's one here http://greatergreaterwashington.org/post.cgi?id=1705) and look at the density involved. Everything on the east side of the tracks is lower-density townhomes; the development is all planned west of the tracks. The tracks themselves (notice there are three) take up a wide swath of land within that 1/4 mile circle where high-density development would be most effective. And yet it seems to work okay for College Park, where a tunnel crosses two tracks, or Vienna and West Falls Church where bridges cross I-66. Sure it'd be nice to have the station on the 'proper' side but this seems like a case where the perfect is the enemy of the good. 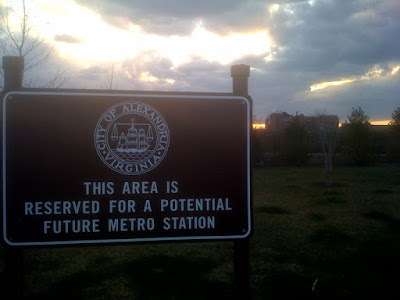 Vienna and West Falls Church are nothing like the proposed development at Potomac Yards. Both are auto-dependent suburbs, and there is very little development within easy walking distance of either. Indeed, both stations are surrounded by more parking structures than by actual development. College Park? The UMD campus isn't within walking distance of the station (it requires a shuttle bus), and there are almost no businesses or dense development near the station. In 2007 (I can't find info for 2008) College Park averaged fewer than 5,000 daily riders, making it among the least used stations in the system. Also falling into that category: East Falls Church, which is separated by I-66 but doesn't have large parking garages for commuters from the outer suburbs like Vienna and West Falls Church. The metro system will be here for many decades to come. We should make smart decisions and investments that reflect that time horizon. I concur with the bridge option. Consider also Franconia-Springfield or, for that matter, the neighboring airport. Using a bridge option isn't going to deter development and it'll almost certainly get a station in there sooner.